“Though mankind is stricken with wonder at its own discoveries and its power, it often raises anxious questions about the current trend of the world, about the place and role of man in the universe, about the meaning of its individual and collective strivings, and about the ultimate destiny of reality and of humanity. Hence, giving witness and voice to the faith of the whole people of God gathered together by Christ, this council can provide no more eloquent proof of its solidarity with, as well as its respect and love for the entire human family with which it is bound up, than by engaging with it in conversation about these various problems. The council brings to mankind light kindled from the Gospel, and puts at its disposal those saving resources which the Church herself, under the guidance of the Holy Spirit, receives from her Founder. For the human person deserves to be preserved; human society deserves to be renewed. Hence the focal point of our total presentation will be man himself, whole and entire, body and soul, heart and conscience, mind and will.” 3. Gaudium et Spes. It is undeniable that humanity is experiencing turbulent times, plagued by crises of different nature. Crises of civilization addressing different spiritualities and demanding answers and guidance. As is said by different scholars, it seems that there is a need for new views of civilization, both for the West and the East, and an urgent need to put a halt to the implacable exercise of biopolitics and biopower, to stop a culture of violence, where human life and its dignity have lost their value. As reflected in the aforementioned thought of Gadium et Spes, humanity anxiously raises questions about the multiple crisis happening now in the world, and Catholics wonder about the role of the Church in face of those happenings, and wonder about the meaning of being catholic, and what can they expect from the Church in present times as well as in a near future. “Today, the human race is involved in a new stage of history. Profound and rapid changes are spreading by degrees around the whole world. Triggered by the intelligence and creative energies of man, these changes recoil upon him, upon his decisions and desires, both individual and collective, and upon his manner of thinking and acting with respect to things and to people. Hence, we can already speak of a true cultural and social transformation, one which has repercussions on man’s religious life as well. (Gaudium et Spes, Preface 4). The global crises that are occurring in different parts of the planet, call for a deepening of social, political and spiritual knowledge in the catholics communities around the world and specifically in the United States. Background: Catholic Church facing urgent challenges. II.1. Spirituality and Religion in the United States. Spiritualities and religions are important fields of human life, and have been subject of research and study by different organizations in various contexts. Given the diversity of spiritual approaches and practices, that have been emerging, the results are particularly important to Catholics, mainly facing ecoumenism. This facts are particularly important in the United States. A study conducted by PEW Research Center (2018) about overall religious experience of Americans -according to practices and faith, showed a rich typology that classifies people in the following categories: 1) those who are highly religious (39%), 2) somewhat believers (32%) and 3) non-religious (29%) where a significant number of Americans describe themselves as spiritual but not religious. The highly religious category was further analyzed and the following subcategories emerged: 1a) sunday stalwarts who are “religious traditionalists actively involved with their faith and engaged in their congregations (17%); 1b) God and Country believers (12%) who are “… social and political conservative, most likely to view immigrants as hurting American culture,” and 1c) the third one was integrated by those who describe themselves as Diversely Devout (11%), who said they were “traditionally religious, but the majority believe in psychics, reincarnation and that spiritual energy can be located in physical objects.” (See Table 1 below). A key question that can be raised from this classification at the beginning of the year 2019, is: what percentage of those who are highly religious or somewhat religious say they are Catholic? II.2. Catholics in the United States. A study carried out by PEW, with Catholics in the U.S. shows that 46% of Americans are Catholic or connected to Catholicism, a number that is extremely important and carries a great responsibility to current Catholic practices. 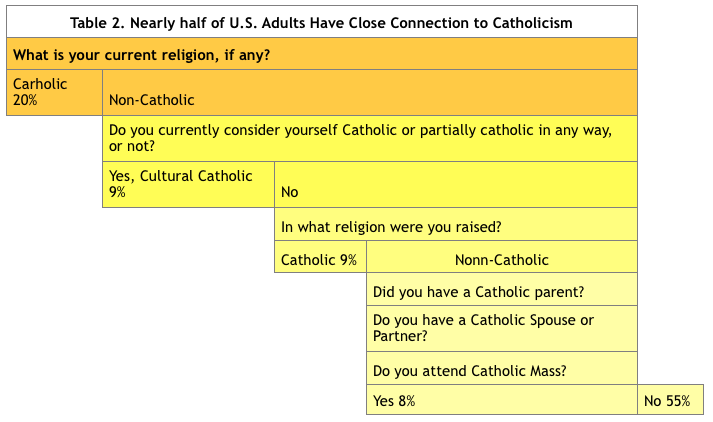 The percentage comes from Americans that declared to be Catholic (20%), those who said that they consider themselves to be Catholic or partially Catholic (9%), those who said that they were raised Catholic (9%) and those who declared to have a Catholic connection -have a Catholic parent, a Catholic spouse or partner, or attended Catholic Mass- (8%). PEW Research Center. “The Religious Typology.” A new way to categorize Americans by religion. Survey conducted Dec. 4-18, among U.S. adults. 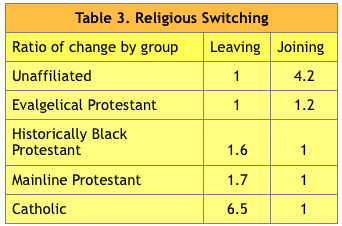 http://www.pewforum.org/2018/08/29/the-religious-typology/ Retrieved on January 14th, 2019. II.3. Being Catholic, a matter of religion or culture? Other findings indicate that both groups of Catholics (by religion or cultural) think it is important to sustain “…a personal relationship with Jesus, belief in Resurrection…” where Catholics by religion have a special devotion to Mary, to receive sacraments and participate in parish activities. II.3. ¿A decline in membership? Two important challenges. According to PEW, the most urgent challenges faced by Catholics are related to a decline in membership, i.e. a decrease of people who call themselves Catholics has switched from 24% in 2007 to 21% in 2015; where a significant percentage of persons who were raised as Catholics has changed to another religion or simply say they have no religion. Pew Research Center also reports that Among U.S. adults, there are now more than six former Catholics. (i.e., people who say they were raised Catholic but no longer identify as such) for 1 convert to Catholicism. II.4. 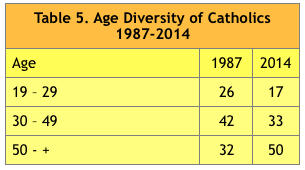 Diversity of Catholics in U.S.
Sgarro indicates that as the “baby boomers” reach the age of retirement, Catholic population in U.S. ages, where today half of the Catholics are over 50 years old, a situation that is presented along with the fact that young people who have been raised in the faith and could replace the aging generation are moving away from the church when they reach adulthood. The 2017 Gallup Report Update on Americans and Religion shows that two thirds of Americans are either highly or moderately religious, and that “… the composition of the adult population is about the same…” than those of 2016, “…where a significant majority of Americans identifying with either the Protestant or Catholic faith, along with about one in five who say they have no formal religious identity.” These data are based on personal reports on church attendance and how important is religion in their lives. II.5. Hispanic Catholics in the U.S.
Parents are much less likely to send their children to Catholic schools. Their sons have been less likely to pursue priesthood. High level of participation in Church sacraments, low level of participation y parish life. II.6. Catholic schools in the U.S.
II.7. Brief summary of the issues that have an impact on Catholics. A “Time line” of situations that have an impact on the Catholic Church offers a panorama of situations that Catholics need to address and that are described in a study by CQResearcher and that summarizes some important moments and events that have occurred to Christianity over the years from 1923 to 2018. Among the issues reported are: the situation of schools sponsored by the Catholic Church and the question if they are of public interest and have an impact on public education (1964); the resurgence of religion in America (1988); the historical academic search about who was Jesus and the argument that this is a path towards understanding His spiritual message and Its relevance in these times (1998); the election of Benedict XVI and the crisis in the Catholic Church, due to the appearance of recurrent cases of sexual abuse by priests (2011); the election of the first Latin American Pope, Francisco, who became the head of about 1.1 billion Catholics in the world (2013), and the phenomenon of geographical redistribution of Catholics in the world (2018) as well as the great growth that Catholic Church is experiencing in Africa and Latin America and at the same time a decrease and cooling in Europe and North America, and whether the church can do something to reverse this decline (2018). The results of the inquiries about Catholics in the US justify the permanent updating of the available data so that orienting strategies can be designed that strengthen their belonging and spiritual practices. This is the main goal of the present study. Questions to be addressed by the research project. The issues reviewed above point to the importance of updating and expanding the available data on the situation of Catholics in the United States, especially because some issues have become more acute and some are turning critical. • What are the most critical issues that the Catholic Church needs urgently to address? • How do U.S. Catholics see themselves today? • In what kind of activities are Catholics involved in their parishes? • What are the most frequent practices of Catholics in the United States?Are they satisfied with these practices? If they are not, what would they like to do about it? • How do U.S. Catholics define the relationship you have with the parish priests and parishioners? • Do young Catholics actively participate parish activities? If they are, what do they do? If they are not, what do you think are the reasons why they do not? • How to motivate the participation of young people in favor of others? • What possibility exists that the Catholic Church make the changes that American Catholics have raised? • And if there is a possibility of making changes, what would be the most urgent? • What are the most urgent transformations that the Catholic Church of U.S. Do you need to perform? Build a strategy, based on lay Catholics opinions, to serve as an effective guide to handle the urgent challenges that currently impact the Catholic Church. Know how Lay Catholics see themselves in terms of faith, practices and parish and community participation. Know the degree of satisfaction that parishioners feel with respect to the relationship they maintain with parish priests. Know the opinions of Lay Catholics in 3 states of U.S., with respect to key issued the Catholic Church is facing today. Make a strategy to guide the Catholic universe on these issues in the most effective way. Theoretical references that support the design of the project. Today, the human race is involved in a new stage of history. Profound and rapid changes are spreading by degrees around the whole world. Triggered by the intelligence and creative energies of man, these changes recoil upon him, upon his decisions and desires, both individual and collective, and upon his manner of thinking and acting with respect to things and to people. Hence, we can already speak of a true cultural and social transformation, one which has repercussions on man’s religious life as well.Gaudium et Spes. Introduction, p.4. The review of the challenges evidences the need of the Catholic Church to understand the moment that Christianity is living, rethink itself and act accordingly. Faggioli’s research and approach to the study of Second Vatican Council offer perhaps a way to understand the scope of transformations that are necessary, if the Catholic Church wants to continue playing an important role in the current spiritual tendencies, being open to the world, or if on the contrary, it will continue traditionally enclosed within itself, alien to current times. “… in order to purify itself and start a process of reparation (which is right and just) and reconciliation (as much as possible in a preferential option for the victim), the church needed and still needs the power of the secular state to find the truth.” (p. xviii). If the Catholic Church decides to address the key issues and the challenges it faces today, it is almost unavoidable to consider the Second Vatican Council, both as an event and a milestone in terms of the transformations that are posed in each of its documents. As it was stated bejore, many U.S. Catholics want to see that the Church makes significant changes. V.2.A. A study carried out in October of 2017, on the Religious Practice of Catholics in Exile, conducted by the Pedro Arrupe Jesuit Institute (PAJI) with “… Cubans who practiced the Roman Catholic religion in Cuba, and did not continue to practice after they left Cuba… of those interviewed, 43% claimed to be practicing…” the Catholic religion, 26% said that they have never been Catholic, 25% answered “other” and only 6% said that they are not Catholic any more. Among the reasons for stopping practicing, 1/3rd said that the Church asks for money too often, 25% that the Church in Cuba was friendlier, 17% says that the Church “here” is too distant from the people, 17% say that “they need to work too many hours”, which is an answer that the PAJI considers needs further research because it could be an excuse; 8% say that other churches “are better.” The main conclusions and recommendations emphasize the following: 1) Parishes should give a warm welcome to those who arrive and 2) Priests need to be careful with the monetary requests. V.2.B. A research among Cubans living in Cuba, carried out by Perez Rodriguez (2015) found that when asked about the opinion about the Catholic Church in Cuba, 70% of respondents answered positively, and 80% responded that they have a very positive opinion and something positive about Pope Francis. In a workshop conducted by the Pedro Arrupe Jesuit Institute (PAJI) of the Ignatian Spirituality Center (ISC) in Miami, with the purpose of finding out if there was interest in developing a Space of Connectivity among different organizations and individuals, it became evident, from the participants and representatives of the organizations that attended, a genuine and deep concern about the situations for which the Catholic Church is going through in present times. The aim was to find out and identify which organizations are responding to what needs, the means by which these organizations connect with people in need and what other means of connection can be used were also explored and the current situation of volunteering was addressed. The topics discussed focused on the need to know if the lay Catholic community is responding to the most urgent needs in different communities, groups and ministries of different locations, mainly in Miami where the seminar was held. What are the urgent needs of communities, groups, ministries, organizations with which you are involved in social action? Which organizations are responding and to what needs? What means are there currently to connect? How do they connect? Can other ways of connecting be considered? Web page? For example. to announce clinics of different themes, to make and distribute a list of resources people can call? A telephone directory? How do these organizations achieve the incorporation of volunteers and their permanence? Lack of communication and connection between different organizations, between groups of lay people and priests, so that it was made clear an urgent need to provide spaces for dialogue between them. From this need arose the proposal to continue gathering and deepening ways to connect. Urgent need to provide attention to people who have multiple characteristics and needs that make them fragile in the current environment, such as immigrant farm workers (refugees who do not speak English, Spanish or Creole, especially from Central American indigenous ethnic groups), urban workers and people deprived of liberty (prisoners). Support these groups in the areas of integral health (including mental health, situations of intrafamily violence and exclusion), with lack and difficulty of finding housing (without a roof), of having employment, and lack of means to transport. From these situations emerged the proposal to create a guide for immigrants (new and not so new) who have nowhere to turn looking for information and that is delivered by the different organizations to those who need it. Need to provide attention to different age groups: children separated from their parents; young people who are not attracted to the Church so it would be necessary to look for ways to approach their thirst for spirituality, innovative ways of connecting with them that have meaning and promote interested participation; elderly people who spend most of their time alone. Facing those problematics situations, a proposal that Churches should become sanctuaries and parish priests be more open to diversity and inclusion was a deeply felt need. Need for a pastoral that generates trust. It was agreed, by consensus, that these issues require further investigation and definition of concrete actions to provide adequate responses. In general, there was a high motivation for enhancing connectivity and joint actions among organizations to generate a significant impact in terms of working for social justice, adjusted to the present times.